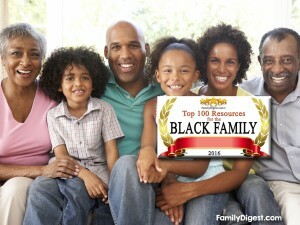 FamilyDigest.com is Black America’s No. 1 Family, Relationship & Parenting Source. Everything Black couples & families are looking for is right here when it comes to having great families, fantastic relationships, great health, and raising kids right! Marlon Cole’s 4FathersJournal.com celebrates the importance of fatherhood through photography, film and other artistic mediums. Amiyrah Martin runs 4 Hats and Frugal where she loves to chat about family, food, fashion and finance; her 4 hats in life. And yes, she is frugal. As Told by V was created by Vanessa Morris to be a safe house for mamas that want it all and proclaim it loud and proud. Unapologetically ambitious. Christina S. Brown’s BabyBrownSugar is all about her journey as an expectant mom. Jennifer Borget’s BabyMakingMachine documents her trial and errors of becoming a Domestic Diva, and her life doing the mom thing while juggling a career. Wife, mom, and fashion-obsessed shopaholic, Trina, uses Baby Shopaholic to chronicle her fashion adventures with her daughters in tow. Bernetta Jackson-Knighten provides Bernetta Style as a resource on motherhood, wife-life, fitness, natural hair, family events and date nights. Black and Married with Kids was created by Lamar and Ronnie Tyler in 2007 to promote positive images of black families and marriages in the black community. Terrence Gaines founded Brotha Tech to tie technology to family. The site teaches parents how to use gadgets to make memories with their kids. Chaton Turner brings us the ChatonsWorld.com blog about the challenges of a working mom who is raising children while married and maintaining good style. Chewsy Lovers covers romance, cooking, and health/wellness as written & photographed by Mandi and Elliot Buckner. Karen Walrond’s Chookooloonks is a lifestyle, travel, inspiration and photography website, all about living with intention and a sense of adventure. Doyin Richards is a dad, husband and blogger committed to celebrating great dads. If you’re a Daddy doin’ work or you’re romantically involved with one – this blog is for you. Ashleigh Evans likes to make sure people know that being on a budget is not a bad thing. She believes its a SMART way to live your life! Founder Heather Hopson’s Diary of a First Time Mom creates content for moms-to-be, new moms and their babies, and beyond. Michelle D. Garrett’s Divas With A Purpose is about women being driven, inspiring, victorious and having a plan of action to become the best them they can be. Amanda Rodriguez offers up Dude Mom is a humor, lifestyle blog written by the best mom in the world. Also, she may be slightly delusional. LaShawn Wiltz thinks that it falls to moms, daughters and wives to be the keepers of all the memories. She wants this blog to make your everyday life beautiful. Fab Haute Mama is about “life, love, motherhood, and musings.” You’ll find photos of children with motherhood lessons learned from her Caribbean heritage. Kimberly N. Foster’s For Harriet encourages women, through storytelling and journalism, to engage in dialogue about the beauty and complexity of Black womanhood. Sisters Lysandra and Dafina use GlamModMoms.com to encourage mothers to aspire to glamour in motherhood through stories, products & services and helpful articles. Ruby and husband Marcus Wright use GrowingUpBlackxican.com to reflect their own struggle to find answers on relationships and parenting a bi-cultural (Black & Mexican) family. Kendra Williams Pierson’s Headband for Today focuses on real women who juggle the multiple headbands of marriage, children, family, career and self. Natasha Nicholes’ HouseOfNicholes.com shows how large(ish) families can have fun, and not go broke, or be bored to tears. Arthur Culter’s I’m A New Daddy arms new dads with resources and advice in a supportive online environment. Thien-Kim’s I’m Not the Nanny shares the fusion of Asian & African-American cultures in parenting, raising biracial children, foodie obsessions, and healthier lifestyles. JackieBledsoe.com helps motivated but overwhelmed husbands & fathers lead and love their families so they can have lasting, fulfilling marriages and influence on their kids. Janeane Davis believes that every working mom can succeed and be happy with the right encouragement, inspiration and motivation and that is why she blogs at Janeane’s World. LittleTechGirl.com is owned and run by Kris Cain – – a tech blogger, computer geek, gadget addict, photographer, and mom to 2 sets of twins. MadameNoire gives African-American women the latest in fashion trends, news, parenting tips and beauty secrets. Dawn founded Mama Harris’ Kitchen to showcase her recipes, food photos, and personal cooking style. Brandi Jeter’s Mama Knows It All chronicles her journey as a single mother and is a resource for women as they figure out what being a mom means for them. Founder Anthonia Akitunde’s Mater Mea is a website that tells the stories of women at the intersection of motherhood and career. Mekeba Giles’s MELISASource.com where she shares life, culture and current events – with an always positive twist. Mimi Green’s MimiCuteLips is a blog for women of all shapes, sizes, colors and walks of life. The goal: empower you to live the life you desire. Lynda Thorn’s MixedBlessingsBlog.com shares her experiences regarding interracial relationships and raising biracial kids. If you’re a father looking to build a closer relationship with your family and be more involved in your children’s lives, Frederick J. Goodall’s Mochadad.com is the place for you. Kimberly Sears Allers’ Mocha Manual website features provocative posts on motherhood. She’s also a well-known advocate for reducing racial disparities in breastfeeding rates. Onica Cupido started The Mommy Factor to share her opinions as an African-Caribbean mother of a biracial child — parenting, fashion and technology. Deanna Underwood wants you to visit her MommyGaga.com if you are juggling kids, cooking, cleaning, work, significant other, budget, all while trying to maintain your sanity! Valerie Pierre’s MommyRandR.com brings moms together in a friendly and relaxing atmosphere that focuses on resting their minds, bodies and spirits. A former television anchor turned stay-at-home mom of one, Joyce Brewer uses Mommy Talk Show to report on current events, latest trends, and product reviews for parents. Ashley Marshall-Seward is the brains behind Mommy Week. Her blog is filled with home and parenting hacks, C46recipes, family travel and resources on living an organic life. Christine St. Vil, the FLY mom coach of Moms ‘N Charge, offers fantastic parenting and self-care counsel. Denene Millner’s MyBrownBaby is for Black moms looking to lend their critical but all-too-often ignored voices to the national parenting debate. This blog from Dani Faust candidly covers balancing family, wellness, hair care, and entrepreneurship from the perspective of a fun-loving, New York native. Nicole Pharr’s Pharr Away inspires, encourages, and informs in a way that impacts the world, no matter how small, through the sharing of experiences. Diane Nassy’s PhilZENDia.com is for you if you know that life’s journey is not always easy and is filled with lessons, hardships, joys and twists and turns. And, choices. Mike Johnson founded Playground Dad to be a resource for dads with technology products, events, stories and advice that helps dads find balance. Louida Martin of Product Review Mom lives by an entrepreneurial example that her two girls and interested moms can learn from. Alison Collins founded this blog for parents and educators to share information, about how to support our children in Bay Area Public Schools. Sarah Hubbell’s ShesWrite.net is a validation for moms that they’re not crazy, for career women that it is tough, that moms just have to be tougher, and that you must have fun. SocaMom.com’s Eva Wilson runs this amazing blog that covers all things Caribbean parenting & community. Sheena Tatum’s Sophistishe.com is a lifestyle blog featuring DIY projects, crafts, recipes, style, and family entertainment. Mr. And Mrs. StillDatingMySpouse (aka Stephon & Pamela King) help couples strengthen their marriage by implementing healthy relationship practices. Kira Odunsi’s Afropolitan Mom is an award-winning parenting lifestyle publication with articles on trends, parenting, technology, beauty, food, family travels and entertainment. Here you’ll find honest perspectives of all things motherhood from Afro-Canadien Bridget “Bee” Quammie, a first-time mama raising a beautiful brown girl in this crazy world! Tonia Sanders says that God blessed her with a wonderful husband and two beautiful girls, and she enjoys writing about them and anything that makes it all easier. Aaronica Cole’s thecrunchymommy.com caters to the many roles that moms and parents have. Danyelle Little’s The Cubicle Chick keeps you abreast of career news, technology, and helpful tips for families to help better manage their personal and professional lives. Regina Sayles’ TheSoloMama.com was created to inspire, encourage, and inform single moms while dispelling the myths associated with single motherhood. This website from Tara Jefferson helps young mothers make informed decisions about relationships, education, careers and parenting style. Letroy Cooke’s Thriftanista in the City promotes thrift shopping as a money saving/eco-friendly way to dress fashionably, and encourages women to be comfortable with their style. Mimi’s Unlikely Martha is about encouraging women to embrace taking care of home without losing themselves in the process. Aspite TV Network was created by Earvin “Magic” Johnson. The network celebrates the African American experience and showcases aspirational images, stories and lifestyles. Black-ish is a popular TV show about a father living in an upper-middle class neighborhood and his struggles to raise his children while ensuring they have a sense of cultural identity. The best college admissions coaching for high school kids who wish to get admitted into top colleges. Black Health Matters provides information about health and well-being with lots of upbeat, positive solutions and tips. Sisters Network is committed to increasing local and national attention to the devastating impact that breast cancer has in the African American community. BlackFamilyToday.com is the place to get 5 powerful tips to help you make your family smarter, healthier and happier… today! Sweet Blackberry, founded by actress Karyn Parsons (Fresh Prince of Bel Air), seeks to instill culture & heritage in children via stories that need to be told and heard. Darryl L. Mobley is publisher of FamilyDigest.com, an author and in-demand professional speaker, and one of the world’s leading life & executive coaches. Dennis P. Kimbro, Ph.D. is one of the world’s leading authorities on personal, professional and family success. Doctor Joyce is a relationship expert and radio talk show host. She also offers individual and group coaching. Zeta has continued its steady climb into the national spotlight with programs concerned for the human condition both nationally and internationally. Alpha Kappa Alpha sorority focuses on the personal & professional development of each of its members and being at the forefront of advocacy and social change. Delta Sigma Theta Sorority is the largest African American women’s organization in the world with a membership of over 300,000 college-educated women around the world. Sigma Gamma Rho Sorority seeks to enhance the quality of life for women and their families in the U.S. and globally through community service. The Links is one of the nation’s oldest & largest service organizations of women committed to enriching the culture and economic survival of African Americans and others of African ancestry. Jack and Jill is an organization of mothers who nurture future Black leaders by strengthening children through leadership development, volunteer service, and philanthropic giving. The Official Web site of the NCAA Eligibility Center. Explore NCAA Divisions I and II initial-eligibility requirements and register to participate in NCAA sports. Heads Up Football is a program developed to advance player safety in the game of football. The Urban League started out as a grass roots, civil rights organization, and has evolved into a powerhouse for helping people secure economic empowerment. MarryBlack.com is the first service within the online dating industry to use the expertise of America’s top experts on Black dating and marriage. MarryBlack.com’s matching is based on its Choice + Connections + CoachingTM System being with members every step of the way. MarryBlack.com is committed to helping Black singles – and all those who want to match with them – find love. Traditional internet dating can be difficult for those Black singles looking for love that lasts. But MarryBlack.com is not a traditional dating site. By becoming a member of MarryBlack.com, Black singles have complete access to the proven Choice + Connections + CoachingTM System for lasting and fulfilling relationships. The site for Black women and men to get dating and relationship advice. 93-100) You tell us who belongs here.